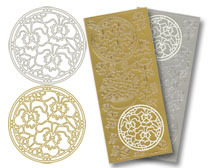 Peel-Off Stickers offer many options for making cards, for scrapbooking and home decoration such as candles, photo frames and Christmas Baubles. The stickers are available in a large variety of images, numbers, letters and texts. The stickers are acid-free and water-resistant and thus ideal for decorating photos, cutlery and crockery.